Enjoy retirement in its best! Completely renovated and ready to move-in. Open floor plan with formal dining room, spacious kitchen open to great room, 3 bedrooms, 2 baths, 2 car garage. 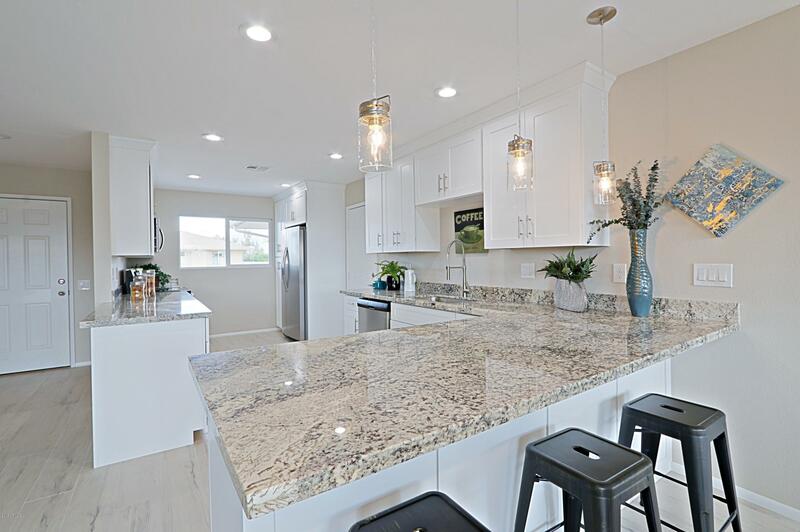 Highly upgraded with tile flooring t/o, carpet in bedrooms, custom cabinets, granite countertops, Stainless steel appliances including fridge, kitchen breakfast bar. New light and plumbing fixtures, new interior and exterior paint, new dual pane windows. Master suite offers double sinks, walk-in closet. Newer roof and HVAC. Inside laundry, epoxy garage flooring. Large covered patio and block fencing in backyard. Home warranty included, this home is 10! Hurry, will not last long!